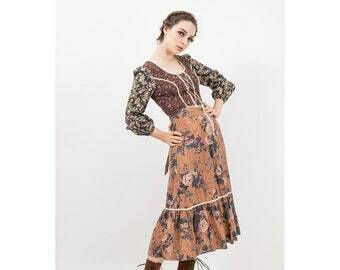 Gorgeous vintage 1970s Hungarian style embroidered dress. Sheer white polyester blend with multicolored cotton floral embroidery. All hand embroidered and hand smocked at the waist and neck. Raglan angel wing sleeve, elasticated waist, A line skirt. Bright red crochet trim on the skirt and sleeves. Condition: Very good, missing the tie at the neck.